Sheldon Menery’s Vision for the Format… and Previews! Each one provides their own valid viewpoint, and now, I’d like to offer my own. I’ve thought about it for a while and it might be a little late to the conversation, I still think it’s worth mentioning. Some of you might be tired of this topic but this is the only time I’m going to mention it. Caped Boy: Excuse me, ladies. You may remember me as the guy who came to dinner a few weeks ago with underwear on my head. My name is Keith Stat from Millburn, New Jersey. State bird, the mosquito. And as you may have heard, I am recently a crowned class B dungeon master. So if any of you would like to play D&D today, please speak now or forever hold your peace. Caped Boy: Maybe you would like to join in? We do need a druid, and you have definitely cast a level 5 charm spell on me. Alexa: In your dreams, douche-bag! Caped Boy: Douche-bags are hygienic products; I take that as a compliment. Thank you. Alexander Shearer of Gift’s Ungiven makes a fair point in his piece about EDH: he wants to know what’s acceptable behavior and what’s not in EDH land. He thinks that by calling someone or an act someone does in EDH a hygienic product, then clearly it’s not the spirit of the format. This is actually a mistake that make tournament minded players make about EDH and sometimes why they’re so hesitant to join this format in the first place. The goal of tournament Magic is to win the game. You play to win the game. It’s simple, you have a clear objective and rules of what is and is not allowed and you play until someone loses. Sure, sometimes there is mana screw or just bad draws which cause you to lose it for yourself, but that’s part of the game. To win, you do it by any means you can legally do whether it’s by counterspells, or blowing up land, or discarding, or playing with an “infinite” combo. There’s not such thing as “unfair” or “unfun” in tournament Magic. Whatever gets the job done is what success in that format. But when it comes to EDH, the landscape is much different. Sometimes people complain about Niv-Mizzet and Curiosity being used to kill someone. Other times it’s recurring Mindslaver to lock someone out of the game. Both (and many other strategies) would be considered just fine in tournament land, but in EDH, it’s frowned upon. If you take a deck like that into a new playgroup or to guys down at the store and they look at you like you’ve just punched Betty White in the face. It doesn’t even have to be a combo deck, just playing counterspells and land destruction and discard effect can all be considered “hygienic product” actions. But you didn’t know, how could you? And that’s what these players want; a social contract about what is acceptable and what isn’t when you play EDH. Clearly there’s a banned list and if people didn’t like these hygienic product cards, why not just ban them? You’ve given me the option to play these cards and complain when I do play with them. You’re the one calling me a hygienic product for playing with cards that aren’t banned. How would I know you’d get mad at me? 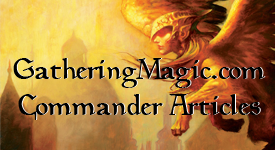 This is the point where we come into the differences between tournament Magic and EDH. In EDH, the point isn’t to win the game (though that’s just a great benefit), but to have fun. If people wanted to build decks to crush other people, they’d enter into tournaments. It’s a completely different mindset going into the casual side of EDH. People don’t want to see all their lands blown up multiple times a game, don’t want to have every spell they try and play countered, and would like the opportunity to at least try and draw their way out of the hole that you’ve discarded them into. By giving people the chance to play spells, it gives them an opportunity to play and interact rather then just sit back, draw a card and wait another 5 minutes for them to do the same thing. It’s fun to interact, that’s why they’re playing EDH in the first place. It’s not only just the card playing aspect but it’s also the social aspect that draws people to EDH. Of course, like anything, there are a few gray areas with this (as with anything EDH related). Players who complain about having spells countered or land destroyed need to lighten up a little; some of that is what keeps a format healthy. Please don’t complain that Mike countered your Fireball that you payed with all your Elves and aimed it at his head. If you come at me with a knife with intention of stabbing me, don’t complain because I shot you with my gun in self defense. “But I wanted to kill you!” Duh, that’s why I defended myself. The cards that counter spells and destroy lands keep other decks in check. “Oh no, you killed my Gaea’s Cradle with your Strip Mine. You’re a bad person for playing Strip Mine.” No, it just helps me keep your elf deck from going insane with mana. By saying that no one can play those things, basically you’re just acting like a combo player who shuts everybody off because you don’t want your stuff destroyed. In Magic, stuff gets destroyed all the time; that’s like taking out blocking because it could kill one of your creatures. You’ve essentially become the person who you called a hygienic product in the first place. This is as close to a social contract for EDH as you can get. While not everyone can agree on one thing, it all boils down to that one question. … You play Armageddon, Decree of Annihilation, Obliterate or Jokulhaups and you have no way to win the game shortly after. … You insist on playing a UB Storm Combo deck in multiplayer and kill everyone on turn 4, taking a 20 min+ turn. … You use Mindslaver and Academy Ruins/Bringer of the White Dawn to lock someone out of the game. … You cast Time Stretch. … You cast Time Stretch… With Eternal Witness and Crystal Shard. … You run both the Pickles lock and Crystal Shard/Draining Whelk in your Teferi, Mage of Zhalfir deck. … You run Erayo, full stop. Add Arcane Lab for added dbaggery. … You Strip Mine my turn 2 Karoo, unless I’m playing Doran, Jhoira etc. Then I probably deserve it. … Stroke of Genius is your kill card of choice. If people are playing EDH they want to play, not sit around and watch people play. The old “Draw-Go” style of countering and bounce doesn’t really count as interactive, because you’re still not really allowing another player to do something. This doesn’t mean that every card in your deck has to be interactive, but if the majority or point of your deck is to shut someone out, then maybe it’s time to re-think your deck. It’s fun to see someone make a million creatures, not take a million turns. Gene: Be proud of who you are. Gene: Shh… it isn’t about the girl, Coop. Coop: Oh. So it is… and it isn’t. Gene: You are ready to be taught the new way. Coop: Will you teach me about this – what is it? A new way? Replace “girl” with “game” and you get our situation. When you started to become better at Magic you learned that maybe you shouldn’t shove every single card you own of that color into a deck. By focusing on what you have made as card choices and making it more streamlined, you learned a new way of approaching the game; you shifted your deck-building paradigm. EDH is just like this. Notice I didn’t say you changed how you played. People don’t complain if you make the right play; sure they may complain that you ruined their strategy, but that’s part of Magic. There might be people lobbing for you to make a certain play, but that’s politicking which we’ll talk about some other time. If you play control decks, play an EDH control deck. If you like certain colors, play those. It’s what people put in their decks are what causes the problem. Card advantage and good plays are not foreign concepts to EDH players. Tournament players know what it feels like to play against combo decks, just doing their own thing until the opponent wins or loses. Watching them shuffle up and play 500 million spells isn’t fun to watch in a tournament if you’re playing against it, what makes you think it would be fun in a casual format where people aren’t competing for money. There’s no incentive to make everyone draw out their deck on turn 4 over and over and over again, just ego. It’s how you shift your way of thinking how you build your deck is what’s going to be the largest difference between tournament Magic and EDH Magic. Vengevine, amazing in tournaments, not so good in EDH. Echo Mage, while not good in tournaments, is pretty ok in EDH. By playing this wacky format, you get to play with cards you most likely haven’t seen since drafting them. You can still make good card choices and streamlined decks in EDH, no one is going to fault you for that. You can build decks with one goal for winning (such as swinging in with an Uril), or build decks that operate different every time. People are encouraged to go out and try new ides in EDH. Maybe, subliminally, I haven’t been posting deck lists on here but more theory and observations. You don’t have to net deck in EDH, make it your own. You like how Sam had his interaction with Card X and Card Y? You can do that too. Have a card you’ve been wanting to try out? Throw it in your deck. Half of the fun in EDH is putting together the pieces of the puzzle that is your deck. The other half, well, that’s up to you. I know that some readers are still on the fence about EDH while some might want a clarification of what to make of all of this. Hopefully, this will help you out with whatever decision or how you feel about this issue. EDH is a fun format, and it’s made even better by the people you play this game with. If you have a group that wants to be as cutthroat as possible, go for it. No one is telling you how to play this great game. However, if you go into a new place with that same deck don’t be surprised if people give you a mean look. Do what I do: pack multiple EDH decks. This entry was posted on Thursday, July 8th, 2010 at 2:38 pm	and posted in EDH, Magic: the Gathering. You can follow any responses to this entry through the RSS 2.0 feed. « Weekend Commentator Diversion – Do You Play Commander on MTGO? I myself play EDH, and yet I have no idea what you’ve said in this post. My group just straight up banned the cards we don’t like and it works out fine. If there’s a card we missed and someone wrecks us with it, we don’t get mad at him or call him a douchebag; after all, he was following the rules. We’ll just revise the banned list. I tend to agree with the gifts ungiven post, calling someone a douchebag is pretty strong language and calling someone that just because they didn’t know your unspoken rules is just hostile and antisocial. See, I’ve always kind of dug the self-governing aspect of EDH too, but I think it’s counter-productive to try to legislate a certain kind of metagame through this official banned list. Why publish an official banned list if it’s a casual format? Why not default to local house rules? An official banned list seems to only have usefulness for the more and more common EDH tournaments. And even in your local group, what’s so wrong with just hating the problem cards? Even locally, it seems to me like banning should be the last resort, and that in truly casual circles, it’s very easy to just politically shame the people who are being annoying in their spikedom… Like the author suggests in the end, most spikes I know have fun, casual decks in their arsenal, cause it’s true that some people are playing for fun. But I think these criticisms are just Anti-Spike resentments hiding behind this contrived championing of the casual player’s cause. It’s transparent spike hating. Groups of people can self-regulate in casual games. That’s why you don’t have casual tournaments and why you never need an official judge or TO to play around the kitchen table. If someone’s annoying, and you hate the decks they play, AND they refuse to stop, you just quit inviting that guy to play. What’s the big deal. I think their whining about cards they’re unwilling to ban simply reveals that they lack the social skills to create a fun casual environment for themselves. There’s a lot of creeps with poor inter-personal skills playing magic, and it sounds like they just don’t know how to avoid those people, or at least have their rofellos deck handy for when one pops up at their casual table. Bah, I could go on and on about this. I disagree with the Sheldon Menery camp on essentially every level of this debate. Spike Haters, pure and simple. This whole topic bugs me. EDH has this nasty elitism that poses as a vanguard for Johnny and Timmy. Sheldon Menery and Bennie Smith are like the mavens of EDH. If you want to see a hygiene product, look no further than these guys. This is true. The thing a lot of these EDH mavens miss is that Spike is a psychological demographic too, and to Spike, the “social aspect” is NOT the whole point. To a spike, the effective plays are the enjoyable ones. These guys promoted EDH, and now they think they own it. They manage the banned restricted list to enforce their own idea of what is fun. So what they claim is an attempt to preserve the “casual” nature of EDH is really just a thinly veiled attack on Spikes in general. They’re straight up saying that Spikes are inferior, and that because Spikes like to win, they’re jerks. There are a lot of different kinds of EDH circles. I agree that bringing Rofellos to a table where you’ve never played before will send a very specific signal to the other players about what kind of EDH you enjoy. But to list “Playing Erayo as your general” among the reasons for d-baggery is pretty revealing. I play a lot of 1v1 EDH, and a lot of competetive EDH. And Sheldon and Bennie both like to brag about how they won. Winning isn’t meaningless to these guys. I find their arguments on this subject insincere and offensive. Spikes have a place at the EDH table too. Stop Spike Hate! This explains why EDH was created. Casual, interactive games. I’m a Spike, and I can still have fun in EDH without playing non-interactive cards. @AB: quote the “official” page all you want. This was a format made up by some kids in Alaska, and Smith / Menery have laid claim to it. I agree they have done a lot to promote the game, but the game is much larger than them, and appeals to many people outside their narrow, exclusionary focus. I applaud you, as a Spike, for being able to get in touch with your inner Johnny or whatever, and enjoy playing “non-interactive” cards. And that’s fine. I like that EDH is primarily a casual format like this. My point is simply that EDH can be played competitively as well. It CAN involve what you’re calling “non-interactive” cards, and depending on who is playing, that can still be FUN! Some people actually enjoy cutthroat, no holds barred, intense competition. Some people see playing against Erayo as a challenge, not merely a convenient excuse to talk down to someone. My problem isn’t with EDH being focused on casual and multi-player, it’s with the arrogance behind those purists and mavens who seem to insist that theirs is the ONLY way to enjoy EDH, and who make value judgments about the character of anyone who enjoys playing it differently. I’m saying that THAT is exclusionary and elitist and snobby and lame. And it’s completely unnecessary. If you have a very casual EDH circle, and someone shows up with Rofellos or Erayo, and everyone hates it, well… that’s self-regulating. You don’t need an authority figure in the form of Bennie Smith to tell you that the Erayo player is a d-bag. That’s just mean and silly… why not just play without the guy, or say something to them? Again, I think the fact that this is even a problem for Menery and Smith demonstrates that they lack basic social skills. Anyone capable of talking to someone should be able to avoid the problems they’re publicly decrying in their articles.